- Significant server improvements over the coming weeks, where we'll be doubling performance increment by increment. released patch notes Over the weeks ahead, we’ll be talking more specifically about some of these features in detail, including the Bounty System for PVP servers and Player Shops in freeports. Whilst the team have begun working on the content changes, we’ve still had a lot done over the past week in terms of updates, with more on the horizon too! In regards to balance, we gave wolves a thorough overhaul, as well as tweaks to both the Wild and Tamed Dragon plus the Kraken is now easier to defeat after having it’s health sliced and more rewarding, with a brand new passive skill that reduces all Feat cooldowns by 33%! Additionally, this patch also introduced phase one of our aging process and the Fountain of Youth. Characters aged 90 years and higher will receive a specialist quest which encourages them to visit the Fountain of Youth to reset their characters age back to 20, remove an age debuff, and receive a rejuvenated buff which is a significant permanent statistic boost. The past week has also included a number of other bug fixes and balance changes as we continue to iterate on and fine tune the live game. You can check out the full list of changes here: current v15.35 - Fixed an issue with Wild and Tamed Dragon scaling which would have cause it to have incorrect stats. - Rebalanced base weights for tamed creatures (increase) v15.33 - Fixed an issue where clients would not correctly see the Rejuvenate buff - Fixed an issue where players could not tame the Dragon using the token - Fixed an issue where players may not have been able to feed bola'd creatures due to a desync on servers v15.21 - Fixed an issue where doors, gateways, and gunports would break on server reload v15.1 - New "Fountain of Youth" quest will appear for characters aged 90 years and higher. The "Fountain of Youth" (currently represented as a magical particle effect) appears in a single Golden Age Ruins across the ATLAS, near the Power Stone Container. Every 50 in-game days, it teleports to another Golden Age Ruins, on a cycle. If you find the Fountain, and activate it, your character will be set back to age 20, and if you do this when you were aged over 90 years, you'll gain a significant permanent statistics boost (you can do this multiple times to gain further boosts, each time when you're at least 90 years old). - Characters over age 90 get an old age debuff that slightly reduces stats (shown in char panel) - Fixed an erroneous feat cooldown time calculation, now all the feat cooldowns are what was originally intended. - Defeating the Kraken now gives you a unique passive skill which permanently and automatically reduces all of your Feat cooldowns by 33%! - Summoning the Kraken now only require the first 8 powerstones (Ghostship powerstone is no longer necessary) - Fixed the bug that was preventing recruiting new Crew in Freeports - Reduced the total time for unclaiming enemy claimflags, the max is now 4 hours, with 15 minutes when at 100 flags. - Vultures no longer target low-health wild creature - Reduced Wolf spawn frequency - Reduced Wolf natural targeting range - Reduced Wolf notify neighbor range. - Reduced Wolf hp and damage - Fixed land creatures AI's not getting aggro properly if attacked from a a ship - Stop Allies being able to Capture other Allied territories - Fixed rapid unclaiming, now if your contested flag is unclaimed it will unclaim at the same rate that it took to claim! - Improved door ticking performance - Added cheat DestroyAllNonSaddlePlayerStructures - Reduced default gold from treasure maps by 50% (as originally intended) and added a new server scaling value for treasure gold. Though, the Official 2x weekend puts the gold back to pre-patch values. - +50% tame damage resistance - Shark and Jellyfish targeting/neighbor ranges reduced 30% - Diving suit adds 90 fortitude now and lasts for 2 hours at surface and about 30 minutes at deepest depths - Crop plots are now prevented from being placed on ships and are destroyed if they were on ships. - Ocean creatures can no longer be Alpha. - Fixed Whale AI to target the ship or player more, rather than the point the player touches the ship. - Fixed NPC Merchant ship showing as overweight when players carried a lot of weight aboard. - Fixed Merchant ship showing as Raft with company ID 0 when looking at it. - Fixed Company ID O showing on none player owned structures on maps (water spouts, etc.) - Fixed Pillars being build-able on PVE islands. - Fixed Fog event not appearing for players using low settings. - Fixed Chicken hurt SFX. - Added new Large Cannon SFX. - Fixed Parrot hurt SFX. - Fixed players not getting aggro when attacking whilst based on a ship. - Added Streamer stealth mode option. - Fixed Monkey hurt SFX. - Fixed a bug causing Map Markers to draw at incorrect locations on the map UI. - Fixed skill description error, "mythical" changed to "legendary." - Fixed flotsam items spoiling when reeled in with grappling hook. - Fixed client crash when transitioning with sextant buff. - Fixed a Song not referencing the correct song buff. - Fixed a bug making it so that the Raft could be repaired for free. - Increased Flame Arrow durability cost to 4 durability consumed per shot. - Reduced Flame Arrow max percentage damage by 25% (4% health per second to 3% health.) - Reduced Flame Arrow max damage per second from 10 to 5. - Reduced Flame Arrow damage to mythical creatures by 75%. - Reduced Kraken health by 60%. - Reduced Kraken Minion AoD Ships ship Health 50%. - Reduced Kraken damage by 50%. - Reduced Wild Dragon damage by 40% - Reduced Wild Dragon health be 40% - Reduced Wild Dragon targeting range by 66%. - Fixed Dragon not returning to its spawn area. - Increased Dragon end aggro grace period from 6 second to 9 as it has a tighter aggro range now. - Fixed Lucky Loader feat ability to not be used whilst prone (as you cannot reload prone.) - Fixed Cloth Gloves clipping into hands in FPV. - Fixed Dreadlocks not shrinking correctly with hats. - Fixed LtOrderSeat collision bug. - Improved death collision to human corpses. - Fixed female emotes playing male voices. - Fixed female player characters using male sleep SFX. - Added ability to place top hat on certain creatures. - Fixed Gorgon "Remove Snake" text. - Corrected Repair box inventory name to read "Ship Resources Box." - Removed Elephant having weight reduction for Wood, as this was never an intended mechanic and resulted in players being able to get around ship weight restrictions. Accordingly, we'll be re-balancing the base weight of tamed creatures early next week. - Fixed treasure guards despawning instantly on stasis. - Fixed Giant snake lock on and player ability to damage it using melee attacks. - Fixed Monkeys dropping human poop. - Fixed Client Crash when rendering ocean harvestables. - Reduced Greek Fire range by 40%. - Increased Greek Fire crafting costs by adding 6 firegel per ammo. - Fixed Cow death harvest component giving the same amount of prime as a Bulls. - Reduced trample damage for all applicable creatures. - Updated Pig force poop ability to scale with creature level, to incentivise taming higher levels. (45 secs at lvl 1 and 15 secs at lvl 130). - Reduced Lion grab weight threshold. Prevents unrealistic grabbing of Wolves and Horses. - Fixed newly tamed creatures being hungry despite being fed during taming. - Increased Dolphin follow ship range by 33%, and reduced interval by 20%. - Fixed Bola'ed HUD to better indicate where to feed creature during taming. - Removed "Giant" prefix from creatures' descriptive name that use it. - Changed "Giant Snake" descriptive name to "Cobra". - Fixed incorrect sounds being used by Lion and Tiger animations. - Fixed incorrect Bear attack ranges to prevent stopping movement for claw attack, which often missed and allowed players to gain distance when being chased. - Reduced attack and AI ranges for Cave Bear, based on its smaller size. - Fixed incorrect item weights for cloth, hide and plate armor. They are now heavier. - Added folder paths for wooden gateways and gates so you no longer see them instantly when opening the Smithy inventory. - Fixed ability of players to feed through walls of taming pens and not get attacked. - Prevented some creatures from not being able to be tamed if they are clipped too far into terrain or structures. - Prevents multi use feeding from the root, putting themselves in harm's way. - Improved Waking Tame Feeding sockets on Cow and Razortooth. - Improved bola socket on Crow - Updated Vulture AI controller to aim lower when targeting corpses. - Fixed various creature spawn issues. - Fixed players being able to bola certain alpha creatures (now you cannot.) - Updated Dolphin to prevent health bars appearing when they follow players. - Improved torpor animations of Razortooth and Ostrich. - Increased Ostrich melee swing socket radius to more consistently land attacks. Updated Ostrich IK to prevent leg distortion when running down slopes. - Reduced max wander height on flyers. - Improved server list efficiency for a better experience. - Fixed Greek Fire SFX. - Fixed player on fire SFX. - Fixed inability to repair door frames in certain constructions. - Added some additional server configs: Game.ini: [/script/shootergame.shootergamemode] EnemyBuildPreventionRadiusMultiplier=1 (only applicable if not using claimflags) bDontUseClaimFlags=false (this will disable claim flags) bUseStaticCharacterAge=false (this will disable dynamic aging) TreasureGoldMultiplier=1.0 v14.11 - Remember 'Show Non ATLAS Servers' setting - No lover overwrites the last connection string - Grid Number columns are now hidden when displaying non ATLAS servers v14.1 - Fixed a client side crash that could occur on login v14 - Launched ATLAS Devkit 11.4 - Fixed multiple exploits which allowed movement of excessively encumbered players through various gameplay mechanics - Disabled non allied players and creatures basing on anchored or docked ships which can be toggled with a server-setting on PVE servers with the in Game.ini - set bPvEAllowNonAlignedShipBasing=true If you want to allow non allies to be able to be on your ship - Disabled feats when encumbered - Melee auto target should no longer pick ally targets in any mode, or player/tame targets in pve - Disallowed freeport npc crew recruiting if 20 or more level 1 npc crew's for that company on the server We’ll continue to work on issues as they arise, including tackling ones that are important to you and relentlessly improving our server and client side performance. Additionally, there’ll be an update later this week which should enable BattlEye for Windows Insider builds which should allow those of you using that operating system to rejoin our Official Network. devkit ho! Early last Friday morning, we were able to release the first iteration of the ATLAS Devkit. As the game continues to grow overtime, you can expect the Devkit to grow in tandem with additional features, content, and gameplay mechanics for modders to enjoy. We put up an announcement thread which covered a lot of details regarding the kit and how you can get the most out of it, so if you’ve yet to have a read, we’d recommend doing so: Additionally, our modding Community Manager, ZenRowe, has also been working on with the team on putting together some documentation for the editor which will be updated on a regular basis. Check it out here: https://devkit.playatlas.com/ Dynamic atlas maps round-up The ATLAS Dynamic Maps is a system that monitors live in-game territory ownership and indicates which companies dominate over the lands. Each week with our Captain’s Log, we’ll be including an image to monitor the progress of the maps, taking note of any exits or new arrivals and any drastic changes in the overall claim. 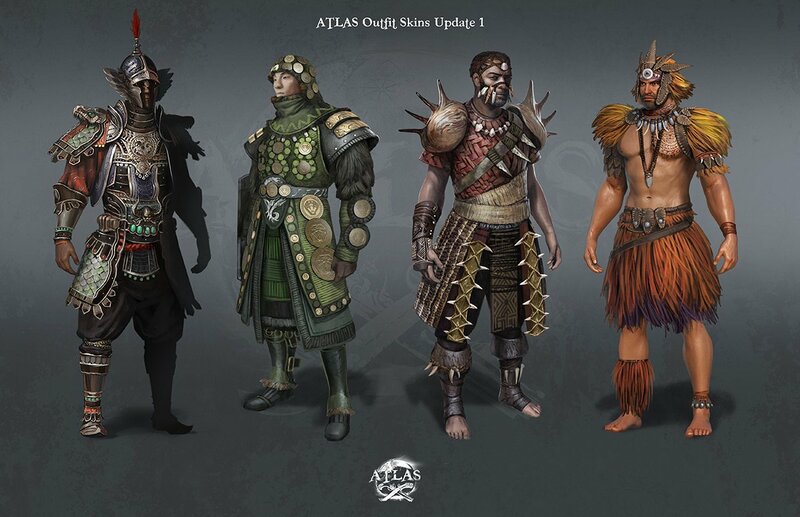 Those who will come to dominate the ATLAS may very well become clear in the days and weeks ahead, though maintaining a large Empire will likely come with its own longer-term challenges… The companies that have occupied islands for a certain period of time will soon gain the automatic privilege to name them on the in-game and web maps, as it is their land! Remember you can don your tribe’s company flag by stylizing it in the game with a paintbrush! Upload your own images or design it how you like, with the top company flags always being visible on https://map.playatlas.com/ [EU PVP] The Whale's Wrath Held: XSM?? ?, French & Ships, Bad Company, BLDX DouYuTV 56876, Chem B, LEGION, ETERNIA, The French Monkeys, and ENSLAVED. [NA PVP] The Kraken's Maw Held: Dynasty, High Seas Booty Bandits, TPG, CSTG, Barry Sails, OWO and The Federation The top companies on both PvP Networks have held their positions! Are we already seeing the best companies as players contend for their place in the overall pecking order or will new contenders emerge next week? And whilst there isn’t active PvP on PVE servers, we’d like to recognize the following tribes for their claims! [EU PVE] The Siren's Call Held: Compagnie des Indes, Paragon, Rum ueber Bord, Woelfe des Rudels, Future Company (HUN), Fenrirs Dogs, Tacorsair, and SouL SanD. Arrivals: Dos Bros$ and SwiftS.RU. Depatures: Black Lotus and M.E.R.C Spirit. [NA PVE] The Hydra's Den Held: Plunderers, Scales & Sails, Dead Men Floating, The Exiles, Atlas Shrugged, East India Trading Co, CN- adilt supplies, Paragon, and Narcos. Arrivals: Lotus, and Darksea Dawgs. Departures: Plunderers and The Salty Seamen. Show 'n Tell Showcase #3 We have extended the due date on our current Show ‘n Tell to give you all a little longer to astound us with your creations, be they your fleets, building designs, imaginative tatts, entertaining videos, original fanart or scenic screenshots. Don’t be shy and head to the submission thread for a chance to win some booty in the form of a cash prize!